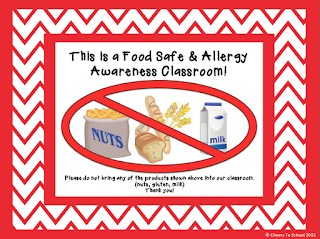 Do you have a student with a food allergy in your classroom? 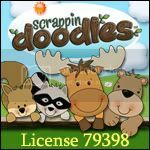 I've noticed every year more and more kids are developing all kinds of food allergies other than the typical peanut/nut allergy. I know it is very important to keep our students safe from allergic reactions. 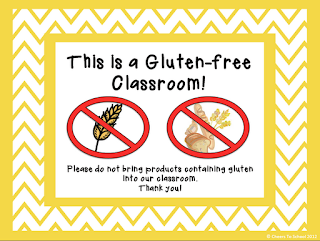 By having allergy safe and awareness signs in the entrance of your classroom will alert people like staff, parents, and visitors know what foods to avoid bringing into the classroom, especially for classroom parties and snack time. Some kids are very severe, such as one student I work with. He is allergic to peanuts, tree nuts, and gluten. As I walk around my school building, I noticed many of the allergy classroom signs are bland and boring looking. So I decided to create my own and I thought why not use the popular favorite, chevron designs, to decorate my classroom signs! I've made the signs with 8 different chevron colors to match your classroom decor. 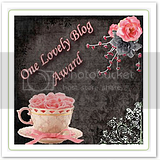 Let me know what you think by clicking on the respective TpT and TN stores link or on the pictures below. Included in this packet are signs for peanuts, all nuts (tree nuts), gluten, soy, milk and eggs. 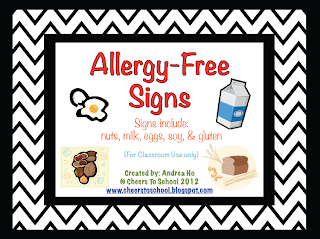 Also, I made combination allergy-free signs for students who have multiple food allergies. 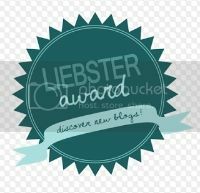 Let me know what you think of my new classroom signs!! 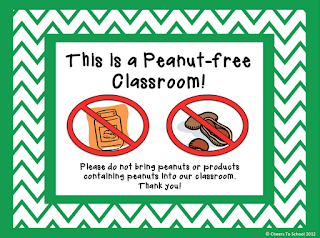 If you don't see a food allergy combination in my packet that you need in your own classroom, please email me or leave a comment below and I will create one for you! Have a great Tuesday! This is the first year I've had a student with an allergy that causes serious reactions. Thank you so much for offering these as a freebie! They just might save the day this year. We could use one for corn...boy is it in everything! Also just one that indicates allergies are in the room and leaves a space to write in which ones and then says Please don't share food! I have had up to 5 different ones and it would be easier to just list them. I apologize Phyllis for the delayed response! 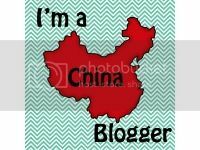 I was traveling for Chinese New Year Break and I'm still catching up on emails! 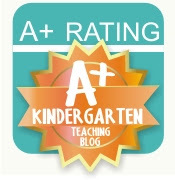 Please email me your email address at andreaho.teacher@gmail.com or click on the email icon on the right sidebar! I would be happy to make a corn allergy for you and a blank sign. Hi! These signs are great! I have a student with an egg and peanut allergy. Would you be able to make a sign with a picture of the eggs, peanut butter and peanuts and then at the bottom say your statement with (eggs and peanuts)? I'm going to use the egg, tree nut and peanut sign for now, thank you!! 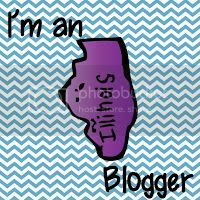 Hi Rebecca, Can you email me at Andreaho.teacher@gmail.com of the colors you want? I can make these signs for you.